A baseball journeyman, Reno Bertoia nevertheless held a number of distinctions. He was one of baseball’s original bonus babies. Of the seven major leaguers born in Italy, he had the longest career, ten seasons. (One of the seven, Alex Liddi, was still active in 2012.) In Bertoia’s big-league debut, with his hometown Detroit Tigers, the 18-year-old infielder batted against Satchel Paige (he struck out). He also happened to live next door to one of the other six Italian-born players. And after baseball, he had a long career as a high-school teacher. Reno Peter Bertoia was born to Libero and Rina Bertoia in St. Vito Udine, Italy, on January 8, 1935. It was 22 months before Reno actually saw his father. Libero had left Italy before his son’s birth to seek employment in Canada. He settled in Windsor, Ontario, across the river from Detroit, and worked as a laborer for the Ford Motor Company. Reno had a younger sister, Julie. Bertoia started playing in sandlot and amateur baseball leagues in Windsor and Detroit at the age of 14. Besides the inspiration he got from Biasatti, he credited Father Ronald Cullen, a teacher and coach at Assumption High School in Windsor. "If anybody would be responsible for me making the big leagues, it would be him," Bertoia said. "He was my coach, my mentor. "3 Father Cullen also coached him in amateur baseball. Then, at 16 he was the starting shortstop for Trumbull Chevrolet, a team in an advanced league that won the National Amateur Baseball Federation championship that year and which he said graduated five players to the major leagues, including Bob Bruce, a pitcher who became his teammate on the Tigers.4 Also, in 1952 he played for the city champion Windsor Sterlings team. At Assumption High School Bertoia played basketball and football, besides baseball. In 1953, as an 18-year-old, he was voted the Best Baseball Prospect in Detroit. That year he was selected to play in the Hearst Newspapers Junior Baseball Classic at the Polo Grounds in New York City with Tigers general manager Charley Gehringer as a coach for his team. After signing his contract, Bertoia sat on the bench for three weeks. He made his debut on September 22, in a game the sixth-place Tigers promoted to boost their lagging attendance. It was the last home game of the year, against the St. Louis Browns, and the oldest pitcher in the league, Satchel Paige, would pitch against the youngest, Tigers bonus baby Bob Miller; fellow bonus baby Al Kaline would also play; Bob Swift would return from nearly a year of retirement to catch his thousandth game. The 47-year-old Paige won the game, his final big-league victory. The 18-year-old Miller was tagged for the loss, and was struck in the head by a line drive in the fifth inning and forced to leave the game. After the season Bertoia enrolled in Assumption College in Windsor and coached junior-varsity basketball at his alma mater, Assumption High School. In 1954 spring training he, Kaline, and Miller did well, with Bertoia hitting .417. Manager Fred Hutchinson declared, "Our bonus boys have reached the point where they won’t embarrass us. I feel free to use them in practically any situation in the regular season. "10 But despite his manager’s optimistic comments, Bertoia was a little-used substitute during the season. He played in 54 games, often as a pinch-runner, and had only 42 plate appearances. His first major-league hit, in his 13th at-bat, was a home run off Baltimore’s Bob Chakales on July 11 that landed in the left-field upper deck of Briggs Stadium. He later would tell a reporter "I knew it was gone the instant it left my bat. If I can hit the ball that far once, I can do it again and again. "11 Bertoia finished the season with just six hits and a.162 batting average. Before spring training in 1955, the 20-year-old Bertoia said, "I don’t intend to spend all season on the bench. The Tigers are in the midst of a youth movement and I expect to be part of it. … I know I can hit big-league pitching if I get a chance to play regularly. "12 But again he had a limited role. He played in fewer games (38), but had more plate appearances (77) than the previous season. He had only 14 hits and one home run, finishing with a. 206 average. The next spring Bertoia appeared destined for minor-league seasoning. His two-year bonus service had expired. At the start of spring training he was assigned to the minor-league unit and played in several exhibition games with the Charleston Senators, the Tigers’ Triple-A team. He was back with the Tigers when the team’s second-base situation remained unresolved. Though he went only 3-for-13 in his first four exhibition games with the Tigers, manager Bucky Harris said, "Certainly he is the best we have on hand, and I’m staying with him. "13 But in May Bertoia was batting only .167 and was spiked in the thumb. The Tigers acquired Jim Brideweser in a trade with the Chicago White Sox and installed him at second base. Bertoia was sent down to Charleston. There he played second base, third base, and shortstop. Finally, playing regularly as a professional, he had a very respectable season. In 125 games he hit .289 with 12 home runs, 26 doubles, and 67 RBIs. Bertoia was recalled to the Tigers after Charleston finished its season. Soon after the story broke, Bertoia’s batting average began to decline. On May 21, with a .352 average, he was held out of the lineup with a sore shoulder. He was in and out of the lineup with the injury, appearing in only four of the next 20 games. Bertoia returned to the starting lineup on June 11. On June 20 he was still the leading American League vote-getter at third base for the All-Star Game. The next day he went 0-for-4 and his batting average dipped below .300. After that Bertoia was held out of the lineup for six games. He also fell back in the All-Star balloting and failed to make the team. In a Tigers victory at Comisky Park on August 10 Reno raised his average to .280 with a home run, a single, and four RBIs. Bertoia finished the season with a .275 batting average and four home runs. He appeared in what was then a career high of 97 games with 325 plate appearances. True to their word, the Tigers opened the 1958 season with the now 23-year-old Bertoia at third base. He was the only Canadian in the Opening Day lineup of any major-league team. He and Kaline were the only two remaining bonus babies of the eight the Tigers had signed under the rule that required two years on the big-league roster. On May 7 Bertoia hit his first major-league grand slam, off the Washington Senators’ Camilo Pascual. After four weeks he was tied for the team lead with 13 RBIs. A month into the season he had played regularly and was batting a respectable .271. He continued to play regularly through June 5, but by then his average had slipped to .235. The next day Bertoia was out of the lineup after the Tigers, becoming the next-to-last major-league team to integrate, brought up Ozzie Virgil and inserted him at third base, replacing Bertoia. Though the Tigers said Virgil’s call-up was based on "merit alone,"24 there were rumors that the local black community was threatening to boycott Tigers games. In a twist of fate, three years later, when Bertoia was playing for the Kansas City A’s, the Tigers brought him back to Detroit in a trade for Virgil, but in 1958 Virgil was an instant hit and displaced Bertoia in the starting lineup for the next 44 games. Bertoia played sparingly the rest of the season. After Virgil’s hitting tapered off, the Tigers moved Billy Martin to third base for much of the remaining season. In a game against the Chicago White Sox on August 10, Bertoia was moved to third base to replace Martin, who had been injured in a collision at home plate. The game had two rain delays and lasted more than seven hours. In the bottom of the 12th Bertoia executed a perfect squeeze-play bunt to drivein the winning run. On September 17 he hit two home runs in a 5-2 home victory over the Yankees, but that game is best remembered for Mickey Mantle’s home run off Jim Bunning that cleared the right-field roof and was estimated to have traveled 500 feet. Bertoia finished the season having appeared in 86 games with 273 plate appearances and a.233 batting average. Beyond baseball, Bertoia also achieved a personal milestone in 1958. After five years of studying remotely at spring training and on the road, in June he earned his bachelor’s degree from Assumption College. Now Bertoia was again a promising prospect, this time for the Senators. During spring training, manager Cookie Lavagetto proclaimed, "We have more young blood and speed. … I feel Bertoia is going to be a big thing for our ballclub. "26 Once again Bertoia got off to a fast start. On Opening Day, starting at second base, he led off for Washington in the bottom of the first with a single and scored. He later hit a home run in what became a 9-2 victory for the Senators. In the second game of the season, which was the Red Sox home opener in Boston, he hit another home run. Bertoia’s hot streak continued. After 11 games he was eighth in the American League in batting with a .370 average and tied for third in home runs with three. On April 30 Bertoia made his first Detroit appearance in a Senators uniform. Washington swept the three-game series. Bertoia went 7-for-16 with two RBIs. A month into the season he was at .305 with four homers. The Senators, a perennial second-division club, were two games above .500 and just three games out of first place. Things changed quickly for the Senators and Bertoia after the first month. His hitting declined and by the end of June his average was .250. The team had slipped to sixth place, six games below .500. Bertoia no longer played regularly. He finished the year with 308 at-bats, a .237 batting average, eight home runs, and 29 RBIs. The Senators finished last for the third straight year. In November Bertoia married 20-year-old Rosalie LaFontaine of LaSalle, Ontario. They had met at a dance a few years earlier. They were married by Bertoia’s former coach and high-school instructor, Father Cullen. Shortly before the 1960 season opened the Senators acquired Billy Gardner from the Orioles. He became the starting second baseman and Bertoia sat on the bench for the first six games. He made his first appearance on April 24, as a pinch-hitter against Boston, hitting a two-run single that tied the game in what was ultimately an 11-10 victory for the Senators. On April 26, against Baltimore, Bertoia replaced the injured Harmon Killebrew at third base, and after that he played regularly for the rest of the season. Killebrew suffered a series of injuries in the first half of the season. When he returned to the lineup he was moved to first base, and Bertoia stayed at third. He experienced what he felt was his best season in the majors. He hit .265 and had career highs in games (121), at-bats (460), hits (122), triples (7), doubles (17), and RBIs (45). He had a memorable series against the Tigers in Detroit. In 1988 Bertoia told sportswriter Marty Appel, "On Saturday night of the series, I made a bad play at third, and after that inning, I was pinch-hit for. I was very embarrassed by that. The next day we had a doubleheader and I had the winning hit in both games. After the game, my dad came downstairs and he was crying. He told me he had prayed for me the night after the error. I’ll never forget that experience. "28 This recollection closely matches the records of a series with the Tigers in June of that year; Bertoia went 4-for-8 in the twin bill with four RBIs but did not have a game-winning hit in either game. Another personal highlight for Bertoia was the birth of his first child, Carl, in August. At the end of the season the future looked promising for the Senators. For the first time in four seasons they had moved out of last place in 1960, finishing fifth. The team was around.500 for much of the season before winding up eight games under .500. The Senators’ core group of promising younger players included Bertoia, Killebrew, Camilo Pascual, Pedro Ramos, Jim Katt, Earl Battey, Bob Allison, and Zollio Versalles. The franchise was also leaving Washington. Owner Calvin Griffith, in the face of poor fan support and an aging stadium, announced he would take the team to Minneapolis-St. Paul, where they would play in 1961 as the Minnesota Twins. On October 2 the Senators played their last home game in Washington, losing to Baltimore, 2-1, before only 4,738 fans. It appeared that Bertoia had finally found a home and was an emerging player on an up-and-coming team. But a different fate was in store for the 26-year-old. In spring training his manager, Cookie Lavagetto, had said, "Reno came a long way last year and he’s going to keep on improving. … I’ve put him in charge of our infield and want him to call all the plays from third base. "29 On Opening Day in New York, in the Twins’ debut, Bertoia was at third base and hit a home run off Ralph Terry in the Twins’ 6-0 victory. In the home opener in Minneapolis, Reno got the first Twins major league hit in Metropolitan Stadium with a leadoff single in the third. But in contrast to his fast starts in prior seasons, Bertoia got off to a very slow start for the Twins. "I put a lot of pressure on myself," he said in 1992. "In those days, if you had two good years you stayed for five and I couldn’t get started." 30 On June 1, batting .212 with two home runs, he became the first Twin to be traded. He was sent to the Kansas City Athletics with pitcher Paul Giel and a player to be named for outfielder Bill Tuttle and a player to be named. 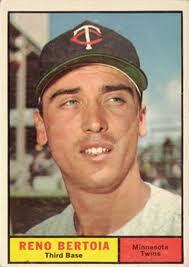 (On June 10 the Twins sent cash to the Athleticsand the Athletics returned Giel to Minnesota to complete the trade.) Bertoia said later that he had "looked forward to playing" for A’s manager Joe Gordon,31 but Gordon was fired shortly after Reno joined the team and was replaced by Hank Bauer. Though Bertoia smacked a pinch-hit double in his first at-bat for Kansas City, on August 2, batting .242 for the A’s, he was traded back to the Tigers with pitcher Gerry Staley for pitcher Bill Fischer and Ozzie Virgil. Virgil, the player who had replaced him at third base in Detroit in 1958, was at the time hitting.133 for the Tigers. Detroit was in a heated battle for first place with the Yankees, whom they trailed by 2½ games on the 2nd. The Tigers needed help at third base because Steve Boros had broken his collarbone. Bertoia was inserted into the starting lineup and played in eight straight games. He went just 4-for-25 at bat and was soon on the bench On September 1, the Tigers began a three-game series at Yankee Stadium trailing New York by 1½ games. The Tigers lost all three games and then five more afterward on the road to fall out of contention. Despite 101 victories in the 162-game season, Detroit finished in second place eight games back. Bertoia played sparingly in the final month of the season and for the year as a Tiger he hit.217. His combined 1961 average with all three teams was .226. During the 1961-62 offseason, Bertoia’s second child, Ruth Lynne, was born. In January manager Bob Scheffing mentioned Bertoia as a permanent member of the infield squad,32 but he played in only five early-season games as a pinch-runner or defensive replacement. On April 28, at only 27 years of age, he appeared in what turned out to be his last major-league game, as an eighth-inning defensive replacement at second base. Shortly thereafter, he was optioned to the Tigers’ Triple-A team at Denver. With Denver he hit well, .357 in 29 games. Later in the season the Tigers sent him to Syracuse, where he played in 55 games and batted.225. In 1963 he went to spring training with the Tigers but wound back up in Syracuse as a player and coach. He batted.324 and still hoped to get back to the big leagues, but the Tigers’ focus was on developing younger talent. Bertoia recalled, "I called (Tigers general manager) Rick Ferrell and said, ‘Rick if I am not back in the big leagues by August, I’m going home.’ "33 True to his word, Bertoia left the team in early August to pursue a teaching position in Windsor. At 29, Bertoia still did not have baseball completely out of his system. The next year, 1964, with the help of Tigers GM Jim Campbell (who had succeeded Ferrell), he signed a one-year deal with the Hanshin Tigers of the Japanese Central League for $17,500 plus travel arrangements. His stay in Japan was an abbreviated one. After less than two months he returned home. He was disappointed with both his own play and some of the arrangements for his family, in particular his pregnant wife, Rosalie. Bertoia had been teaching in the offseason and after his retirement from baseball quickly transitioned into his second career. He worked for 30 years with the Windsor Catholic School Board as a social-studies teacher. One of his students, Joe Siddall, went on to play parts of four seasons in the major leagues with Montreal and Detroit. He was a part time scout for the Tigers and then the Toronto Blue Jays. He was inducted into the Windsor/Essex Sports Hall of Fame in 1982, the Canadian Baseball Hall of Fame in 1988, and the University of Windsor Alumni Sports Hall of Fame in 1988. In 2005 Bertoia was the focal point of a novel, Reno, by Marty Gervais, a retired Windsor Star columnist. In the book a 12-year-old boy with polio idolizes his hero, Reno Bertoia, who is contending for the batting championship. In 2009 Bertoia traveled to Italy, where he threw out the first ball at an Italian Baseball League game in Parma. Marty Appel, Yesterday’s Heroes: Revisiting The Old-Time Baseball Stars (New York: William Morrow and Company Inc., 1988), 37-39. Brent Kelley, Baseball’s Biggest Blunder: The Bonus Rule of 1953-1957 (Lanham, Maryland: Scarecrow Press, 1997), 31-34. Tommy Devine, "Bertoia’s ‘Happy Day’ May End Soon," Detroit Free Press. May 17, 1957. Joe Falls, "Here Today; Gone Tomorrow," Detroit Free Press. August 5, 1961. Joe Falls, "Look Who’s in ‘Fireplug’ Role for Twins – Reno!" Detroit Free Press. March 12, 1961. Sam Greene, "Bertoia Draws Fans Sympathy in First Game," Detroit News, September 23, 1953, 73. Walter L. Jones, "Looks Like ‘Another Long Season’ in the Second Division for Senators," Nevada State Journal (Reno), March 11, 1955, 10. Brent Kelley, "Reno Bertoia: One Bonus Baby Who Made It, "Sports Collectors Digest, April 3, 1992. Hal Middlesworth, "Bertoia Tosses Bat Into Battle for Third Base Job on Bengals," The Sporting News, January 2, 1957, 21. Hal Middlesworth, "Harris Seeing Spots Before Eyes, Instead of New Tiger Stripes," The Sporting News, April 18, 1956, 20. Hal Middlesworth, "Reno ‘In Solid’ At Second Base," Detroit Free Press. April 11, 1956. Watson Spoelstra, "Bengal Build-Up for Bertoia Bills Reno at Hot Sack," The Sporting News, December 11, 1957, 24. Watson Spoelstra, "Bengals Break In Third Bonus Baby," The Sporting News, July 21, 1954, 18. Watson Spoelstra, "Bengals Tag Brideweser for Keystone," The Sporting News, May 23, 1956, 15. Watson Spoelstra, "Bunning Now in Running as Fanning King," The Sporting News, June 12, 1957, 18. Watson Spoelstra, "Scheffing Strikes Optimistic Note Over Tiger Curving Corps," The Sporting News, January 17, 1962, 27. Watson Spoelstra, "Tigers to Sink or Swim With April Lineup," The Sporting News, July 31, 1957, 21. Jack Tighe, "Manager’s Outlook: Tiger Manager Happier With Acquisition of Martin," Nevada State Journal (Reno), December 24, 1957. "Baseball, Feature Writers Gang Up On Unheralded Young Reno Bertoia," Jefferson City (Missouri) Sunday News and Tribune, May 26, 1957, 19. "Bertoia May Mean Payoff For Tigers," Corpus Christi (Texas) Times, April 11, 1956, 5-B. "Bonus Kids Not Liabilities But Assets, Declares Hutch," The Sporting News, April 14, 1954, 14. "Out of the Bottle," Time, May 27, 1957. "Reno Bertoia Is Hopeful," Traverse City (Michigan) Record Eagle, February 15, 1955, 12. "Third 18-Year-Old Bonus Player is Signed by Detroit," The Sporting News, September 9, 1953, 18. "3 Tigers Leading in All-Star Voting, Jefferson City (Missouri) Daily Capital News, June 21, 1957, 7. "Tiger Trainer Belittles Furor Over Bertoia’s Tranquilizers, The Sporting News, May 29, 1957, 10. 1 Reno Bertoia, Personal interview, 30 Nov. 2010. 5 Brent Kelly, "Reno Bertoia: One Bonus Baby Who Made It," in Sports Collectors Digest, April 3, 1992, 221. 6 Marty Appel, Yesterday’s Heroes: Revisiting The Old-Time Baseball Stars, (New York: William Morrow and Company Inc., 1988), 38. 10 "Bonus Kids Not Liabilities But Assets, Declares Hutch," The Sporting News, April 14, 1954, 14. 11 "Reno Bertoia is Hopeful," Traverse City Record Eagle, February 15, 1955, p. 12. 13 Hal Middlesworth, "Reno ‘In Solid’ At Second Base," Detroit Free Press. April 11, 1956. 16 "Baseball, Feature Writers Gang Up On Unheralded Young Reno Bertoia," Jefferson City (Missouri) Sunday News and Tribune, May 26, 1957, 19. 17 "Out of the Bottle," Time, May 27, 1957. 18 Watson Spoelstra, "Tigers to Sink or Swim With April Lineup," The Sporting News, July 31, 1957, 21. 19 Tommy Devine, "Bertoia’s ‘Happy Days’ May End Soon," Detroit Free Press. May 17, 1957. 21 Watson Spoelstra, "Bunning Now in Running as Fanning King," The Sporting News, June 12, 1957, 18. 22 Watson Spoelstra, "Bengal Build-Up for Bertoia Bills Reno at Hot Sack," The Sporting News, December 11, 1957, 24. 26 Walter L. Jones, "Looks Like ‘Another Long Season’ in the Second Division for Senators," Nevada State Journal (Reno), March 11, 1955, 10. 28 Appel, Yesterday’s Heroes, 38. 29 Joe Falls, "Look Who’s in ‘Fireplug’ Role for Twins – Reno!" Detroit Free Press. March 12, 1961. 30 Kelly, "Reno Bertoia," 221. 31 Joe Falls, "Here Today; Gone Tomorrow," Detroit Free Press. August 5, 1961. 32 Watson Spoelstra, "Scheffing Strikes Optimistic Note Over Tiger Curving Corps," The Sporting News, January 17, 1962, 27.